WestRock is an advanced manufacturer that specializes in the production of liquid dispensing solutions for consumer packaged goods. An integral part of this production facility and critical to operating efficiency is a network of automated guided vehicles that transport materials between production and the warehouse. In order to ensure these vehicles stay on task, WestRock coated the pathways with Tennant’s Eco-SDS™ in a semi-gloss finish. The ability of Eco-SDS™ to dissipate electrostatic build-up insures that the vehicles guidance systems function properly. The blue colored floors identify the vehicle pathways for employees. The red areas caution employees to the vehicles turn-around zones, which are locations where the vehicles may pivot, turn or back-up. The result – Eco-SDS™ Semi-Gloss is contributing to providing an efficient, automated and safe work environment while improving its appearance. 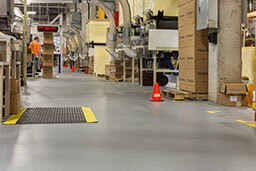 Tennant’s Eco-SDS™ Semi-Gloss is a durable, chemical-resistant, static dissipative urethane coating that helps reduce the effects of static electricity. 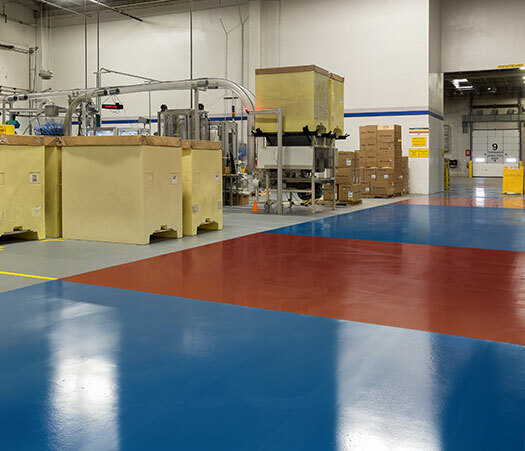 This nominal 25 mil static dissipative system includes an epoxy primer and a light stable urethane topcoat with a semi-gloss finish. Eco-SDS™ Semi-Gloss is available in a variety of standard and custom colors. 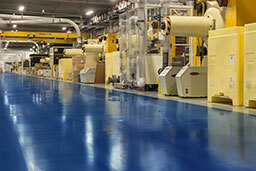 Eco-SDS™ Semi-Gloss – A durable, che​mical-resistant urethane coating that reduces the effects of static electricity.